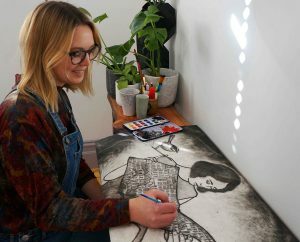 Tiffany Jones Fine Art Consultant is delighted to launch on Saturday 13 October, from 2:30 to 4:30 pm, the first Queensland solo exhibition for Kate Piekutowksi, one of Australia’s most talented young etchers. 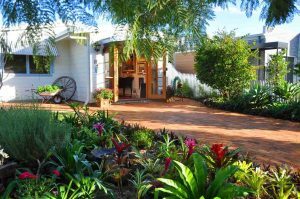 Already well known to art lovers in Tasmania and Victoria, Queensland art collectors will now be able to acquire and view Kate’s lovely pieces from Tiffany’s delightful Art Studio at Buderim on the Sunshine Coast. Kate creates beautiful “Unique State” etchings in very limited editions using complex techniques such as multiple plates, hand painting and gold leaf. Each etching is an individual artwork in itself that takes many hours for Kate to create. 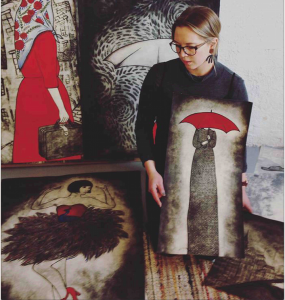 Kate’s first Queensland solo exhibition “Where Memories Fall” offers an eclectic selection of over 30 etchings that reflect her Polish ancestry, her love and nostalgia for the streets and architecture of Europe, the indulgence of fine wine, and the delights of travel. Beautifully framed in classic black and antique red frames, the etchings range in value from $595 to $1,700. See more of Kate’s amazing etchings available NOW to purchase & reserve. A special feature of the Opening of Kate’s exhibition on 13 October will be an elegant collaboration with highly respected winemaker and wine judge Samantha Connew from Stargazer Wine. Samantha is the youngest person and only woman to be admitted to the prestigious Chair of Judges at the Royal Sydney Wine Show. 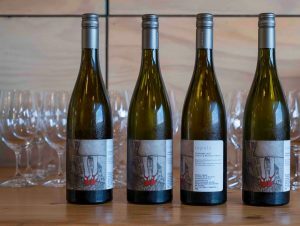 Read James Halliday’s review of Stargazer’s limited release fine wines. 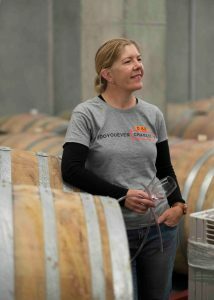 Guests at the opening will be treated to Samantha’s stories about her life with wine, and an exclusive wine-tasting of Stargazer’s Tasmanian Riesling and the latest Rada and Tupelo vintages that feature Kate Piekutowski’s lovely artwork on their labels. on Saturday 13 October from 2:30 to 4:30pm to chat with collectors. from 10am to 3pm, with no appointment necessary. – contact Tiffany on 0407-452 024 or Email: tiff-art@bigpond.net.au to organise. Saturday 13 to Sunday 28 October, 10am-5pm.